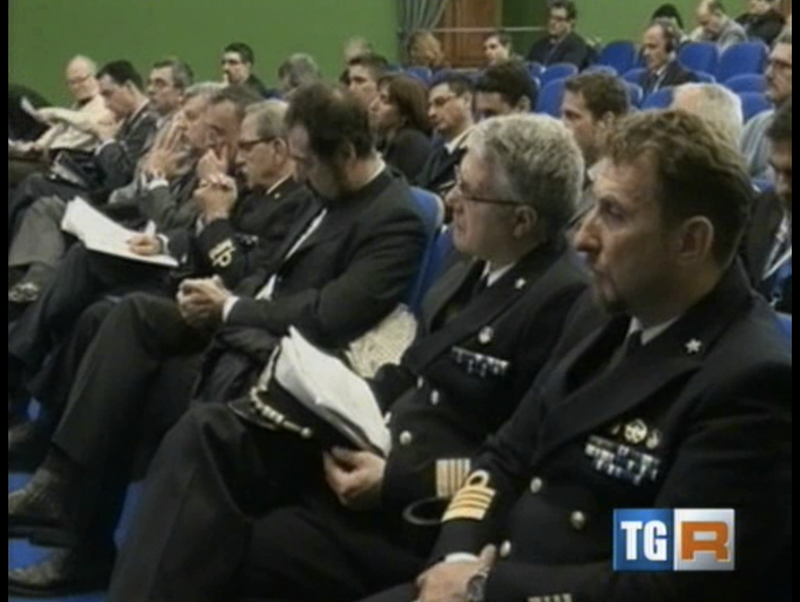 The head of the Italian Civil Protection Department takes part in the Conference about technology for the safety of navigation. The promotion of the Argomarine project. Isle of Elba, Portoferraio. The Conference held at the De Laugier Centre on Wednesday 21st November about the “New Strategies and technology for the safety of navigation in the Mediterranean sea” brought together again, in a fortunately non-dramatic event, the main protagonists of the accident which occurred about a year ago on the Isle of Giglio with the sinking of the Costa Concordia cruise ship: the head of the Italian Civil Protection, Franco Gabrielli, the Admiral Illarione dell’Anna, head of Livorno Coast Guard, Massimo Avancini from the Ministry of the Environment and Giampiero Sammuri, before becoming the Park’s President, manager of the Environment Department in the Province of Grosseto. These are the people who avoided, after preventing the loss of lives, a terrible sea disaster on the Isle of Giglio. The Conference was organised as the Argomarine Project’s final event, a research by the National Park of the Tuscan Archipelago on the monitoring of hydrocarbons in the sea. The event provided the occasion for showing that the aim at the end of three years of activity has been reached: to put a data collection system into use (MIS Marine Information System) which can provide a scenario of maritime traffic and of the pollution risk in real time, with the integrated use of satellite, electronic nose, buoys, autonomous underwater vehicles, aerial images and alarm signals of volunteers thanks to a smart phone app created by the researchers for the purpose. The Italian Civil Protection, the Italian Ministry of the Environment and the European Union have all appreciated the outcomes of the project, promoting it as a model to be developed and applied in environmental emergencies especially after the Costa Concordia case which is the starting point and case study for most of the conference speeches. Sammuri, the Park’s President, opened the conference with some impressive data on the loss of biodiversity in nature, referencing, as an example, the halving of forests and wetlands and remembering the resounding environmental disasters which the sea has been exposed to, with considerable economic and political effects on the global system. Sammuri revealed how disasters such as that of Costa Concordia let one reflect on the limits that man must impose on himself and the importance of respecting the rules in order to prevent damage to the environment. The Argomarine’s results are well integrated in this context as they enable rules to be respected using an immediate and effective monitoring and control system. After having spoken generally about the Italian Civil Protection’s National Plan, Gabrielli insisted on the urgency of planning in Italy. He added also that even effective laws and advanced technology do not help progress if Italian citizens do not acquire the culture of awareness that causes each of us to get informed about the risks that threaten Italian territory, to understand the behaviour that must be adopted and the activities that the institutions must carry out. This is because a citizen who is aware is a demanding citizen, also as concerns the tools that the institutions must secure. Gabrielli also greatly approved the outcomes of this research funded by the European Union and hoped that the experimentation would continue as it helps prevent disasters and allows immediate interventions which keep the negative consequences to a minimum. Similarly, Dr Avancini’s speech highlighted the Ministry of the Environment’s interest in Argomarine and the positive function in favour of the speedy of the technological response in the operating stages. He hoped that the research would constitute a pilot project to help protecting the sea. The Admiral Dell’Anna stressed the fundamental role of the Harbour Master’s offices in the protection of the sea and the importance of measures for the safety of navigation, highlighting that Coast Guard uses technology on a daily basis to ensure safety at sea. The engineer Maurizio Maggiore, official of the European Commission Directorate General for Research and Technology Development, Unit Transport, which funded all the activities of the Park’s Project, confirmed that, as well as having correctly reached the aims, a communication model has been drafted which will be used as an example to be followed in other European research projects. See all the presentations of the speakers who took part in the conference!